You've added Red Brick Road Ciderhouse, National Automobile Museum of Tasmania, Alexandra Suspension Bridge, and other attractions to your itinerary. 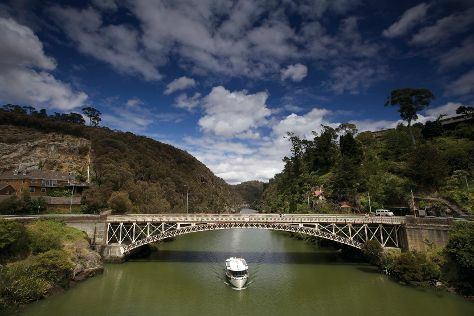 On the 1st (Wed), snap pictures at Alexandra Suspension Bridge, examine the collection at National Automobile Museum of Tasmania, sample the tasty concoctions at James Boag Brewery Experience, look for gifts at Gourlay's Sweet Shop, then sample the tasty concoctions at Red Brick Road Ciderhouse, and finally join in the after-dark buzz at Saint John Craft Beer Bar. To see where to stay, more things to do, other places to visit, and other tourist information, use the Launceston day trip tool . Brisbane to Launceston is an approximately 5.5-hour flight. You can also do a combination of flight and bus; or do a combination of car and ferry. Plan for a bit cooler temperatures traveling from Brisbane in August, with highs in Launceston at 13°C and lows at 1°C. On the 2nd (Thu), wrap the sightseeing up by early afternoon so you can travel to Swansea. To see other places to visit, maps, where to stay, and more tourist information, refer to the Swansea trip maker website . You can drive from Launceston to Swansea in 2 hours. Expect a daytime high around 15°C in August, and nighttime lows around 4°C. On the 3rd (Fri), you're off toHobart. Your day-by-day itinerary now includes Cascade Brewery, Food Tours, Richmond Bridge, and other attractions you added. When in Hobart, make a side trip to see Port Arthur Historic Site in Port Arthur, approximately 1h 10 min away. There's still lots to do: take your sightseeing to a higher altitude at Mount Wellington, contemplate the long history of Hobart Convict Penitentiary, engage your brain at Tasmanian Museum and Art Gallery, and look for gifts at Hammer and Hand Metal Gallery. For other places to visit, maps, more things to do, and other tourist information, go to the Hobart route planner . Traveling by car from Swansea to Hobart takes 2 hours. August in Hobart sees daily highs of 15°C and lows of 4°C at night. On the 6th (Mon), you'll have the morning to explore before heading back home.